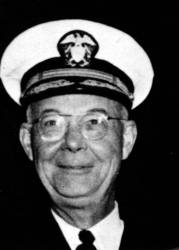 The Pacific War Online Encyclopedia: Withers, Thomas Jr.
Thomas Withers was commander of the Pacific Fleet submarines in the early days of the war. He was the first to propose that the submarines be directed against commerce rather than employed with the battle fleet. This was the correct military strategy and played a major role in bringing down Japan. On the other hand, Withers responded to reports of defective torpedoes by relieving commanders he thought not sufficiently aggressive; the torpedo crisis would not be resolved until Lockwood took command of the submarine force at Pearl Harbor. His orders to submarine commanders reveal an unhealthy fear of air attack. Commanders were ordered to remain submerged during daylight hours when within 500 miles of a Japanese airbase, a wholly unrealistic requirement. They were also ordered not to use more than two torpedoes against merchant ships, also unrealistic. Withers was reassigned as commandant of Portsmouth Naval Yard in May 1942 and served here for the remainder of the war. Following the surrender of Germany, he was reprimanded for failing to prevent captured U-boats from being looted and their crews robbed of decorations, watches, and other personal effects by base personnel. In one incident, a U-boat commander was slapped during an interrogation.